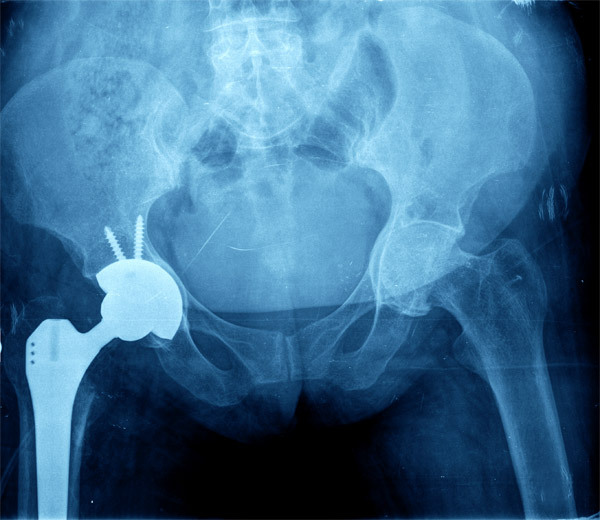 While new technology and advances in surgical techniques have greatly reduced the risks involved with hip replacements, there are still some risks you should be aware of. Two of the most common possible problems that might occur in the short term (just after surgery or up to 3 months after) are dislocation and blood clots. Because the artificial ball and socket are smaller than natural ones, the ball can come out of the socket if you put the hip in certain positions. Positions to avoid include pulling your knees up to your chest, crossing your legs, or bending your hips farther than a right angle. Blood clots can occur in the veins of your legs or pelvis after hip replacement surgery. To reduce the risk of clots your doctor will prescribe some combination of special exercises, support hose, and/or blood thinners. Other complications such as new or ongoing pain, stiffness, fracture, bleeding, or injury to the blood vessels can occur. Sometimes infections elsewhere in the body can travel to your prosthesis, but this is not common. Serious medical complications, such as heart attack or stroke, are even rarer, and if they happened, would most likely occur just after the surgery. To minimize the risk of complications, it's important to know how to prevent problems and to recognize signs of potential problems early and contact your doctor. For example tenderness, redness and swelling of your calf, or swelling of your thigh, ankle, or foot. could be warning signs of a possible blood clot. Warning signs of infection include fever, chills, tenderness and swelling, or drainage from the wound. You should call your doctor if you experience any of these symptoms. It is important to get instructions from your doctor before leaving the hospital and follow them carefully once you get home. Doing so will you give you the greatest chance of a successful surgery.